Growing up in Lake Oswego, Peter graduated Lake Oswego High School in 1968. Peter attended Oregon State University graduating with double degrees in Political Science & Business Administration in 1973. Hired as an accountant by Crown Zellerbach for their Timber & Wood Products Division in Molalla, Peter quickly climbed the corporate ladder eventually being promoted to their Corporate Headquarters in San Francisco. A growing interest in the local Real Estate market quickly became a passion and within 2 years of landing in San Francisco Peter joined forces with another Crown associate and formed the Real Estate Brokerage of Holly, Raynal & Clark (HRC) that eventually had offices in San Francisco & Atlanta. HRC specialized in Residential Real Estate and the restoration, management and sale of “Historic” Income Properties (Multi-family). It was in San Francisco where Peter met the love of his life, Laurie. After a whirlwind courtship, they were married in 1978 and the rest, as they say, is history. Peter & Laurie were blessed with son Alex in 1984. And blessed again in 1986 with the arrival of Katie. California no longer seemed the right place to raise a family so in December of 1988, Peter, Laurie, Alex & Katie packed their bags and moved back to the Portland area settling in West Linn. Peter immediately joined forces with Signature Homes as the Sales & Marketing partner and began building homes. Signature Homes built Executive level homes in Lake Oswego & West Linn. 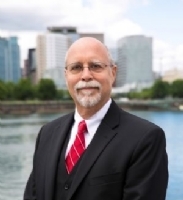 Peter joined the Hasson Company Realtors that same Spring (’89) and remained a top 10 producer in the Lake Oswego office until invested in and helped establish the Keller Williams Realty - Portland Premiere Market Center in January 2005.